Best resort in OBA!!! 3BR/ 3BA with Amazing Views! Ask about our DISCOUNTS!! Our 3BR/3BA Unit is About 1800 Square Feet on the Northwest Part 'D' Building on the 9th Floor. You Can Sit on Your Balcony and Enjoy the Perfect View of the Daily Sunsets Over the Water. You Also Have a Great View of the Boat Slips and Watching All the Boats Going in and our of the ePass. You Also Have a Nice View of the 3 Tiered Pool Area Between the C & D Buildings. Our unit Has 3BR/3BA and is a Very Spacious Unit. The Bedding in the Rooms Are as Follows: Master BR (King Bed), BR #2 (Queen Bed) and BR #3 (Twin Beds). It Has All Granite Countertops in All Bedrooms and Bathrooms. It Has All Stainless Steel (Kitchen Aid)Appliances in the Kitchen. it Also Has a Wet Bar with Granite Countertop with Wine Cooler/Refrigerator and 35 Gallon Ice Maker (for the Beach or Pool). the Laundry Room Has a Large Efficiency Washer/Dryer. All Rooms Have Large HDtv LCD TV'S with Direct TV and Over 110 Channels (Including HBO) and DVD Players. We Also Have Free T1 High Speed Internet. Wireless High Speed Internet is Also Available and Free in the Lobby/Atrium Area. There Are Plenty of Things to Do at Caribe Resort: Play Tennis, Practice Your Putting (Golf), Bacce Ball, Playground for the Kids, Saunas (Dry and Humidified), Workout (Large Weight Room and Exercise Machines), Several Swimming Pools (Heated Indoor or Outdoor--with Large and Fast Slides), Large Lazy River Float, Hot Tubs (Several), and Most Importantly the Beautiful Beaches! There is Also a Deli on the West Side of the 'D' Building. This Serves Sandwiches, Ice Cream Etc. Next to the Deli is a Brand New Game Room Where You Can Play Video Games (Nintendo Wii, Xbox 360, Play Station 3, Etc with Large LCD TV Screens) All Day Long for a Small Fee. the Game Room is Open from 1000am to 600pm (Weekdays) and 1000am to 900pm (Weekends). There are plenty of things to do at the Caribe Resort and this resort will soon become your kids favorite place to visit. So book your reservation now and start your family memories today. 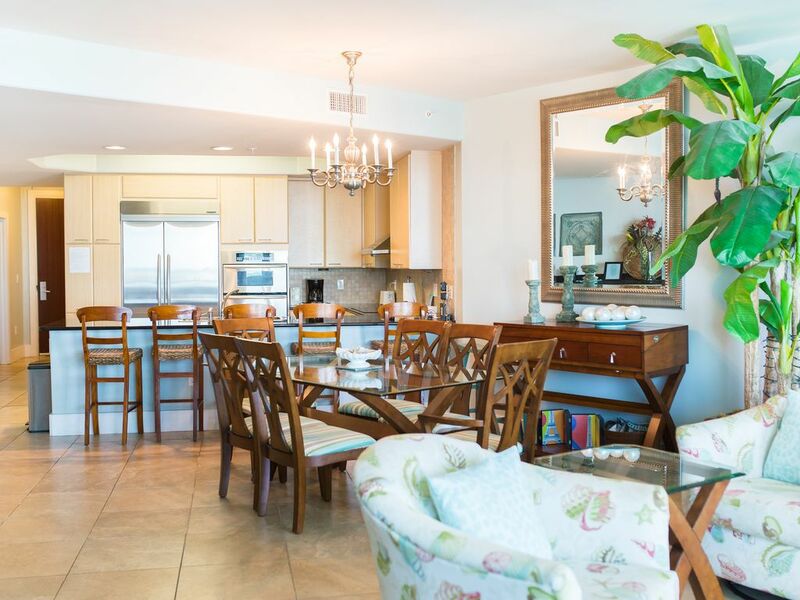 This condo is lovely and is at the "Best resort in OBA"! The decor and furnishings are fashionable and yet comfortable. The beds are great and the bathrooms are well-cared for. The kitchen is well-equipped and it is easy to prepare meals there. We entertained family and friends while there and the open concept certainly applies to this condo. There is an ample supply of bed linens and bath towels and the laundry room equipment is in good condition. The owner was very pleasant, easily accessible to answer any questions and was a pleasure to work with. We would love to return at some future time. Beautiful Condo with Stunning View! It was our first time to Orange Beach & we loved it! Super nice, well appointed condo with large balcony & beautiful views of the harbor. Full size washer & dryer & lots of towels & blankets. It was a great experience overall & our little grandchildren's first time at the beach! We will go back! We had a great time staying in this home. Everything was perfect and the condo was stocked for all of our needs. There were even extra floats in the closet so we didn't have to purchase any. Michelle was so easy to work with and the front gate had our parking passes ready when we arrived, even late that night. We would definitely recommend this unit as a choice to stay in the future! Thanks a million!!! I appreciate your sweet review. I love positive, happy guest! What is not to like about Caribe? Thanks for choosing Caribe D-903. Please come back! Beautiful condo, wonderful owner! Very relaxing! We stayed here this weekend and absolutely loved it! The condo is very nice and has so much room! The decor is lovely, the beds are so comfortable and the view from the balcony is perfect. Bring a few groceries, and you could spend your entire vacation in the condo, you'd never have to leave for anything. The owner, Melissa, is super nice. We've stayed in a couple of her other units and they're all great! I would definitely recommend booking your vacation with her! Thanks again, we will be back! Thank you very much for this sweet review. I love having repeat guest and enjoy making sure their stay is what they expected and more! My family loves to share our Caribe units with other families and hopes that they enjoy staying here as much as we do. Thanks again and please come back!!! 5 Star just doesn't do this place justice! We have been vacationing at the beach for 10 years now (5 years with children - now 1yr, 3yrs, & 5yrs) & this condo has, BY FAR, been our favorite! The unit is so spacious, the decor is amazing, & the amenities offered at the resort itself are great! We enjoyed the Caribe Cruiser (a covered pontoon boat ride, also saw lots of dolphins! ), the Caribe trolley (which took us to & from the beach - the kids particularly enjoyed this! ), the Cobalt restaurant (located right beside The Caribe - best seafood we've found so far...we ate there 4 times during our week stay! ), & my husband loved night fishing from The Caribe pier! I can't even begin to say how wonderful the pools are!!! There are SO many & the slides were a HUGE hit for all of my children. Melissa was so nice & accommodating - she was on top of anything we might have needed. Such a pleasure to work with a nice owner! I would HIGHLY recommend this unit to anyone - especially with children! Just amazing - can't say enough!!! We stayed in this unit for a month. We loved it. We have stayed in several other units at the Caribe for the past 5 years and this unit has the most well equiped kitchen we've encountered. The view from the balcony is wonderful and the balcony has more than ample seating. The owner was most accomodating. We look forward to returning and relaxing in the Lazy River. It is great having guest that appreciate and take care of this condo. We take pride in making sure our guest enjoy their stay and have a great experience while at Caribe. We love meeting and getting to know our guest.